To keep it simple, we're two eager travelers with roots in the US. Having explored quite a bit of our home country together, we set our sights abroad and kick started our foreign travels in Southeast Asia. With everything we own in our backpacks, we set off on our five-month trip. What day is it today and where did we stay in Ho Chi Minh City? Today is Friday, the 16th of November, 2018, and our third day here in Ho Chi Minh City. We are at the Jungle House hostel for our last night, presumably. We're up to try a lot of different hostels for the experience - maybe one day making our own - but for now we're in a good area to explore District 1. What did we explore today in Ho Chi Minh? The abundance of pagodas throughout the southeast Asian region is almost mind-blowing. Vietnam in particular has some of the most impressive pagodas we've seen thus far, with most maintaining a rather raw atmosphere. The statues and relics are, of course, maintained and taken care of, but the surrounding buildings and areas always seem to be dilapidated. Stray dogs scurry about as shirtless older men puff cigarettes, and we wander around both engaged and slightly confused. Not exactly sure if we were welcomed, we peeked into the front entrance of the pagoda and looked around. A Vietnamese man ushered us to come inside, so that's just what we did. Not sure what to make of a temple of the Chinese sea goddess Mazu, we wandered around gazing above at the light streaking throughout the space. We haven’t seen such sharp light, caught by the incense that flows in the gentle breeze. It was a sight to see after walking amidst broad daylight, backs dripping in the heat. Learning more about the temple inside, we came to understand that Mazu was a deified women that saved others from a typhoon with her special powers. There are timely figures throughout and plenty of amazing artwork to check out. Definitely recommend if in the area! In Southeast Asia, street food is the way to go. We've read about it time and again, but we can tell you from firsthand experience that it's true. Skeptics aside, the food is prepared before your very eyes with fresh ingredients bought from the market nearby. For those concerned of the quality, use your best judgment; if food looks old and stale, visit another food cart. Usually the ones where locals are chowing down is a safe bet! The Bitexco Financial tower is definitely a marvel of modern engineering. Construction of the building began in 2007 and was completed in 2010, with the end structure resembling a lotus flower. The lotus is the national flower of Vietnam and represents the aspirations of the rising war-torn nation. 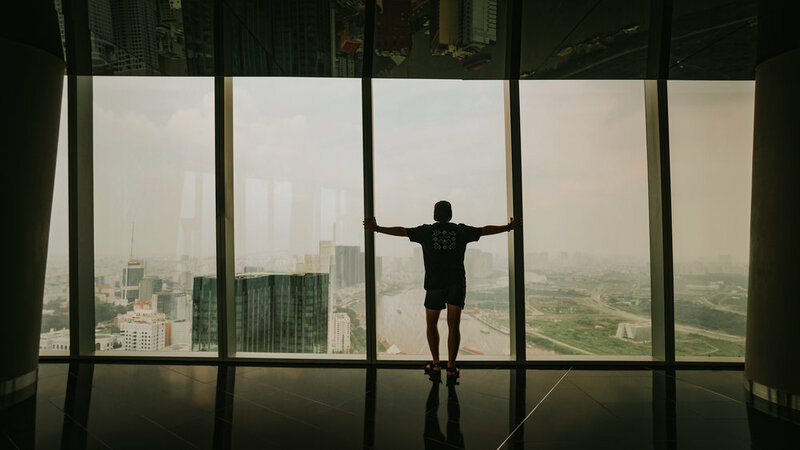 Sixty-eight floors make up the tower, with the 49th floor being the Saigon Skydeck - an observation area for visitors. For an entrance fee of 200,000 VND, it was the most expensive purchase yet, but it was well worth it with the incredible views. Looking down below we could see the congestion of buildings and motorbikes, as well as the Saigon River dividing the land. The rich history of Vietnam can be seen through it's architecture, especially the Notre Dame Cathedral. When the French had conquered Saigon, religious services and communities were established for them by the Roman Catholic Church. The Cathedral still stands to this day and is open to visitors at select times. It was closed when we approached the gate, but the onslaught of rain detoured us away toward the post office. Located right across the street from the Notre-Dame Cathedral, the Saigon Central Post Office is another marvelous display of French architecture. As we were heading over, the weather took a round turn without warning and a torrential downpour ensued for the following 15 minutes. Seeking shelter underneath a tree didn't help too much, so we jogged to the local McDonald's and waited out the rain. Beating the crowd (or so we thought), we went straight over to the post office. Built between 1886-1891, it is still fully functional and offers guests the option to send souvenirs and hand-written letters back home. Not ones to usually partake in these kinds of tourist activities, we grabbed a couple gifts for those back home and sent it back to the US. Being accustomed to email and the internet, writing a letter did feel a little strange, but it was a cool experience. 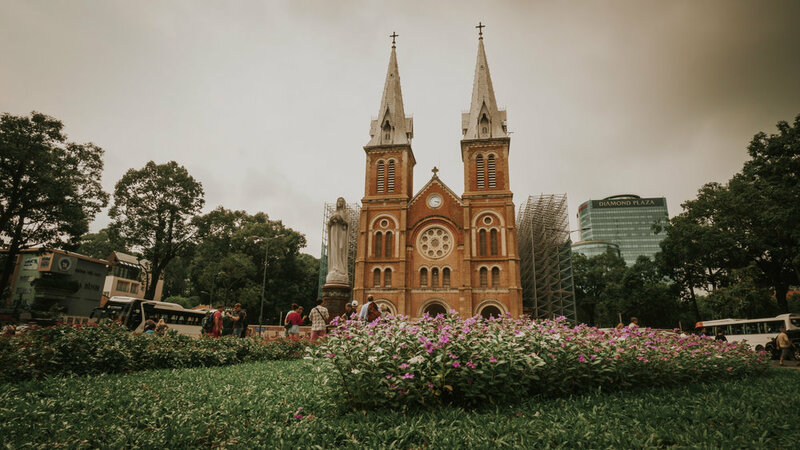 We recommend visiting the Cathedral and post office when you're in Ho Chi Minh! You won’t find a more convenient place to mail items across the world than here. How much did we spend traveling in Ho Chi Minh City? If you'd like to see more of our journey through Southeast Asia, check out our Facebook page or subscribe to our RSS feed. All our posts at the touch of your finger--read on!